I know that I'm supposed to be hauling out the pumpkins now. Dusting off the pumpkin recipes. Buying nutmeg, ginger, and cinnamon. But I'm kind of in denial. Could summer really be over? It flew so very quickly this year. Maybe because it was so awesome. Because we had our first family trip in years. Because the kids were delightful and so much fun to be with. Because we made wonderful memories and relaxed like nobody's business. Maybe that's why I don't want to let go. I will, though. Starting with this acorn squash. A sure sign that fall is here. Here's to a wonderful fall and winter. To the tantalizing smells of pumpkin and nutmeg. To warm stews and hearty soups. And to many more wonderful summers. This recipe feeds six. Make more or less, depending how many mouths you have to feed. Preheat the oven to 350*. 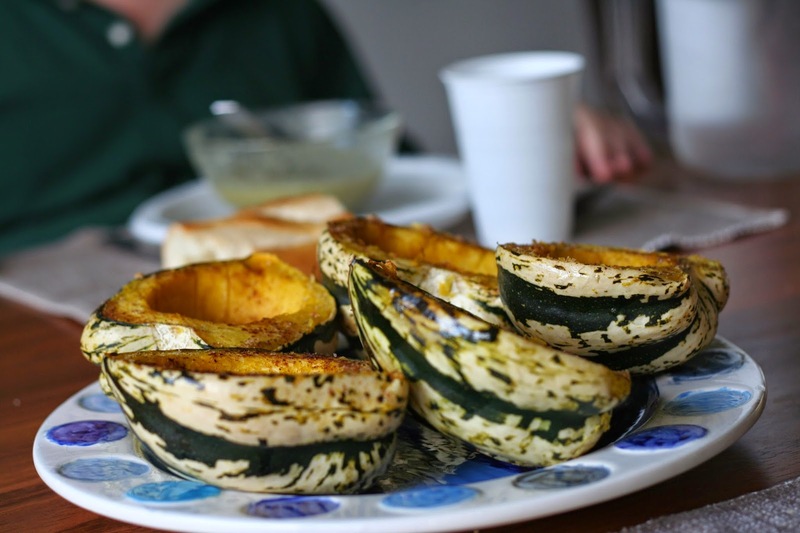 Wash and dry the squash and spread them out on a baking sheet lined with parchment paper or foil. 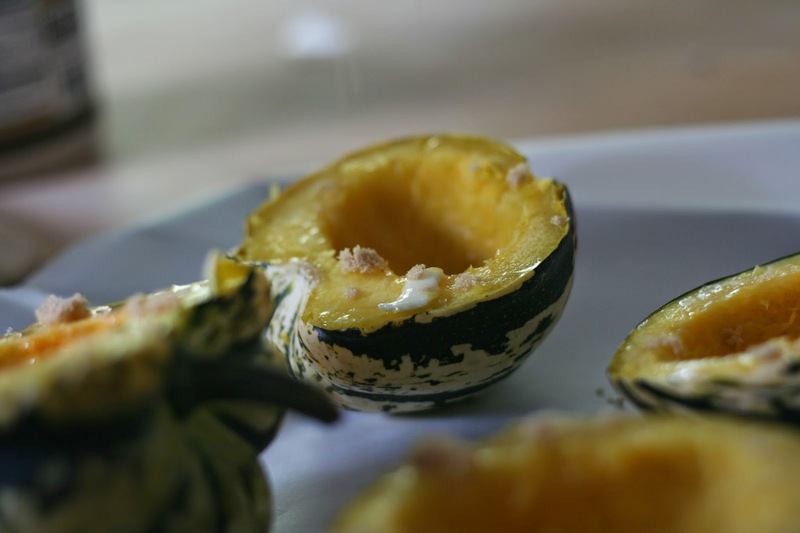 Bake the squash for about ½ hour, more or less, till they 'give' a little when you squeeze them. You want them slightly softened so you don't hack off any fingers while cutting them, but not baked through. 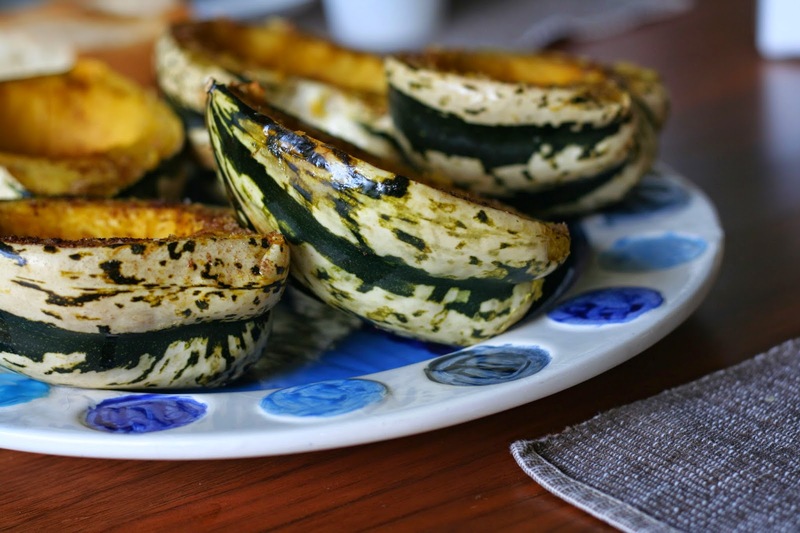 Remove the squash from the oven and turn the oven up to 400*. 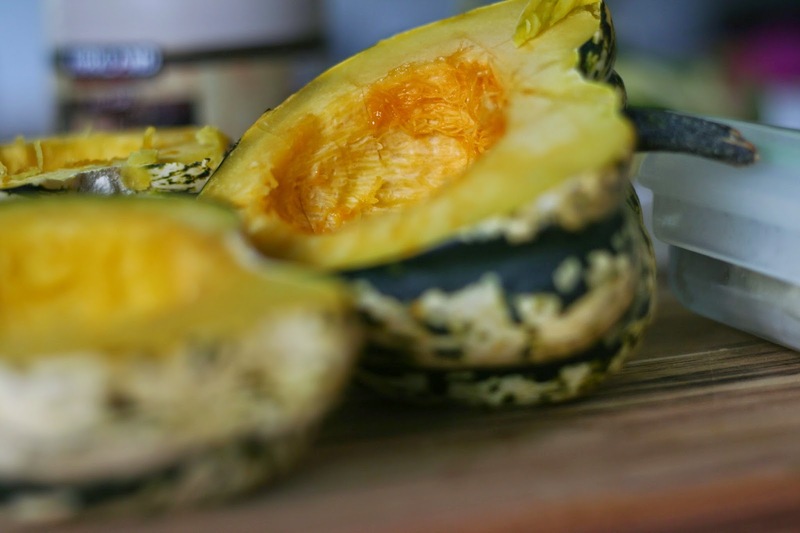 Use a large knife to cut each squash from stem to pole, making two symmetrical halves. Let them sit on the counter, cut side up, for about ten minutes so they are cool enough to handle. Use a metal spoon to scoop out the seeds. Discard them. 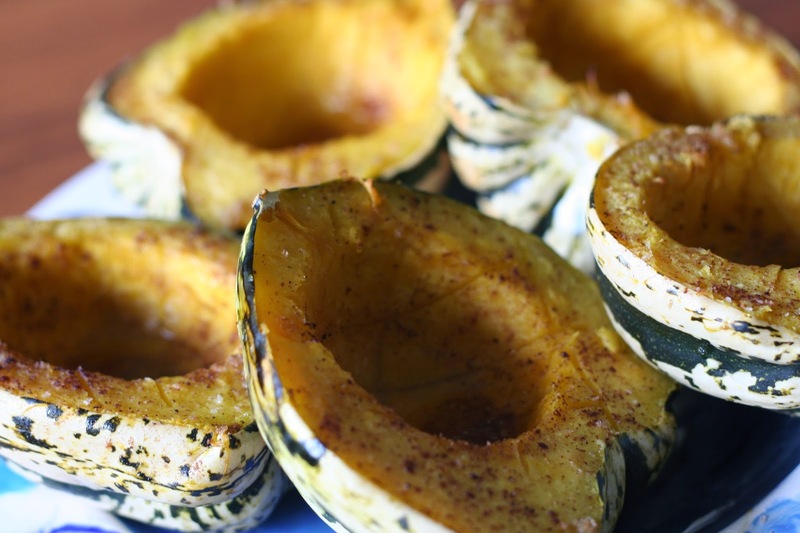 Put ½ teaspoon of butter in the center of each squash half. Let it soften and then rub the butter all around the entire surface of the squash. Sprinkle about ½ teaspoon brown sugar over each one. 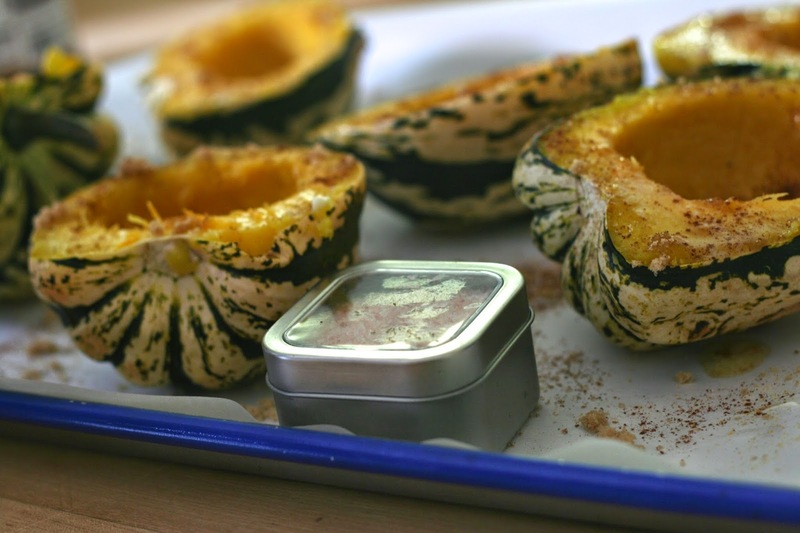 Grate some nutmeg over the squash. There's no precise measurement here; just use your judgment. Sprinkle with ginger and cinnamon to taste, followed by salt, using about ⅛ teaspoon of each. Bake the squash, cut side up, for another 20 minutes or so, until browning and glazed. Serve warm or at room temperature. Yes! I love seeing the winter squash lined up at the farmers market. The colors just mean fall! Looks great--does the Himalayan pink salt make a difference in taste? 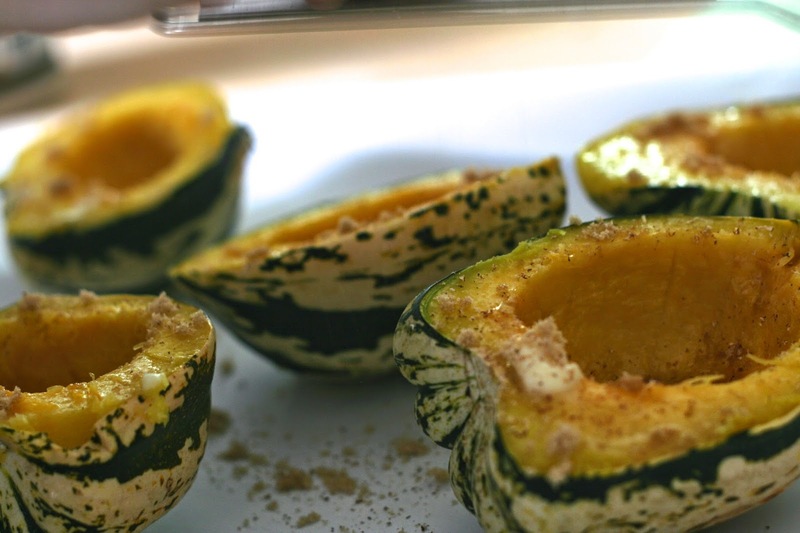 Interesting idea to cook the squash a bit before cutting it in half. Thanks, Laura. Yes, this was a great technique - saved me from hacking at the hard squash (and potentially my fingers!). I have to tell you that I really do like the pink salt - I find it has a really pure saltiness. That being said, it doesn't make a huge difference and this is still plenty tasty with plain old kosher salt. 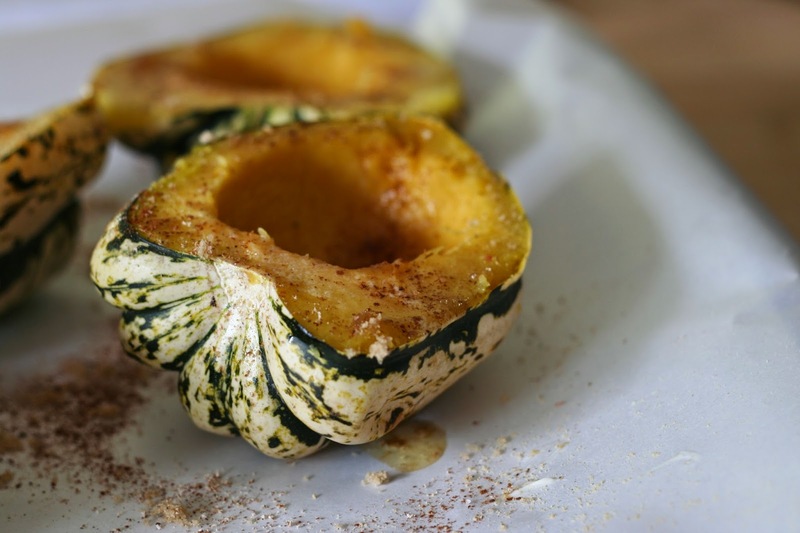 I don't know that I'm ready for full on fall...but I always love roasted acorn squash! It's a favorite of mine too! I can't wait to roast my first squash! I already made soup and pie so this is next. I love the seasonings you used! Ginger especially. I hope you try it! I have yet to make winter squash pie and soup this season. Will get to that soon! Roasting vegetables makes their taste more profound! Looks delish!